My kids hate talking about money. Or maybe they just hate talking about it with me. Mostly, I hate any conversation that has actual numbers in it. But I love my kids, and I know that life is SO MUCH EASIER when money is well managed and in perspective. So here are a few of the things I tell my kids without really talking about dollars and cents. 1. Little habits can cost you big. Let’s say, just hypothetically, that you are in the grips of an expensive beverage addiction. You line up, day after day, to pay for a pricey coffee, rather than serving yourself for pennies at home. The $4 a day you spend on fancy coffee adds up to $1,460 a year, which would be enough to put you in a decent used car. But you won’t buy it. The car, that is. Because you bought the coffee. So, think hard before you start smoking or hoarding cats. 2. Have a list of things you like to do that don’t cost money. 3. Everything’s negotiable. This may not be entirely true, but the people who believe it seem to save a lot of money. 4. Baking soda is cheap and does 52 amazing things. 5. Don’t marry for money. But keep in mind that people who are good with money are usually good at a lot of things. 6. Money is the easiest thing to replace. You can always make more money. Time, relationships, dignity, trust, and reputation, on the other hand, are hard to come by. They are hard to create the first time and virtually impossible to replace. Don’t sell them short; don’t sell them out for one another; and whatever you do, don’t sell them for mere money. 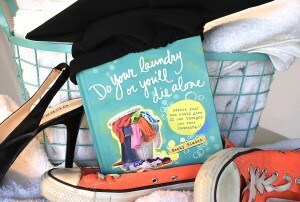 Portions of this article are excerpted from Do Your Laundry or You’ll Die Alone: Advice Your Mom Would Give if She Thought You Were Listening, written and illustrated by yours truly. It makes a great grad gift or college CARE package!